The healthy ingredient natto (fermented soybeans) which has been got close to Japanese from the past is receiving attention around the world. It contains high quality protein and many nutrients necessary for our body like calcium and vitamins in a good balance. Speaking of natto, not a few people doesn’t like the unique smell and stickiness, but even they can eat our delicious snack "Dry Natto" that we exercised our ingenuity in. "Dry Natto" is made with our original technique called the decompression fry method. The decompression fry is a technique to fry ingredients at low temperature, under the low pressure near to a vacuum. 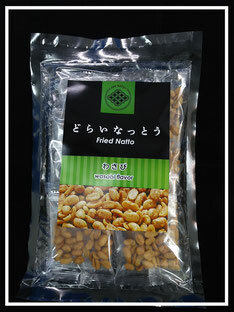 When natto is fried at high temperature, the Bacillus natto which is the most important nutrient dies. However, using decompression fry method, we can keep natto bacterium alive. By frying natto in vegetable fat and oil less than 150 degrees Celsius instantly, water is evaporated. The extra oil is removed with a centrifuge afterwards. There are few smell and stickiness, you can enjoy the crispy texture for six months. Cabin attendants offer our products to business and first class passengers as an in-flight snacks for 20 years. 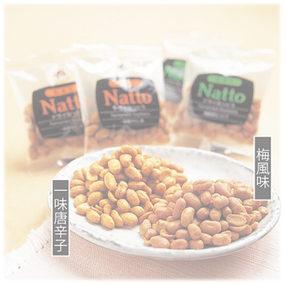 "Dry Natto" is popular for an attendant of air travel now, it becomes OEM products of domestic natto makers and everyday snacks of preschool children now. Our products command considerable attention from overseas companies for these past several years and come to make a deal. I would be happy that "Dry Natto" spread to China, the United States and the world and many people have it of high quality and safe. My motto is the word of Yukichi Fukuzawa who founded my old school "The thing that it is the most fun and excellent in the world, is to have work of the life". I keep this word in my bosom and continue efforts to make "Dry Natto" more popular in the world.